“Teapot’s” real name was James, but he was always known by his nickname, which was given him by his uncle when he was a small boy. He would say that he used to help his uncle pick up stones off the road. His uncle was probably a Council roadman who would hammer local stone by the roadside for use on the country roads. He spent all of his life in Campden, sometimes living “rough” if he happened to be doing a nightwatchman’s job, but mainly living with his old acquaintance, Julie Howell, in a Leysbourne cottage. His parents were Mr. and Mrs. R. Williams of Ebrington – he was the second son of a family of ten. He was born disabled and for most of his life had to rely on two sticks to get him around and he left strict instructions with the local undertaker, Mr. Don Ellis, that his sticks where to be buried with him when he died – “in case I need them on the other side”!! He was a “jack of all trades”, but whatever he turned his hand to, he did well. 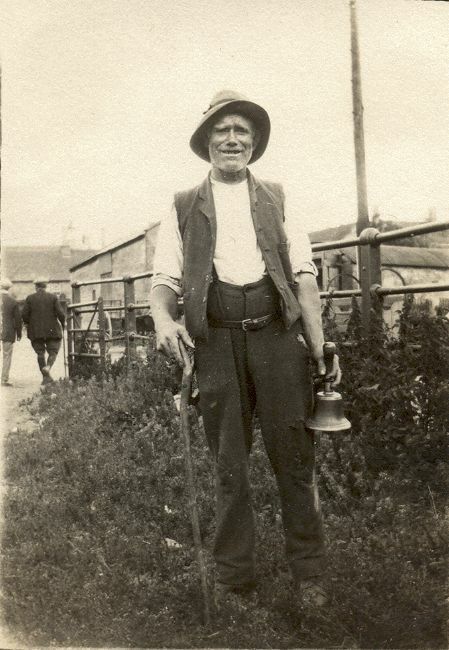 At one time he drove the mails to and from Campden Station in a horse-drawn vehicle and did farm work and gardening. He was well used as a birdscarer among the many cherry orchards around Campden at that time and one picture shows him with his rattle and length of string that clanged the tins tied in the trees. At one time he had been an apprentice to a wheelwright. In a broadcast from Campden in 1948, Teapot was questioned about his travels and said “I’ve been as far as Stratford, but otherwise I’ve never been a stone’s throw from this place”. When asked who he would like to be, he thought a bit, and then replied “ What’s ‘is name, up in London – Churchill – you can ‘ave all they cigars, y’know”!! He was very fond of a smoke and was delighted when several listeners to the broadcast sent him gifts of cigars. His health became poor after a long winter and he died in April, 1953. The funeral service was at St. James’s Church, Campden. He never married.